Clubhouse for the working golfer, a lot was done with a tight budget. 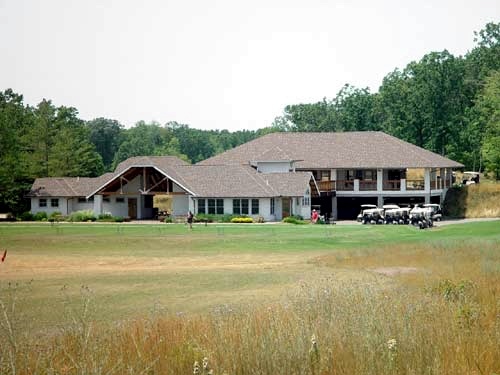 Designed as a series of elements contained under a large roof structure, the resultant breezeway provides a logical entry into the golf setting. The large picnic pavilion allows groups to celebrate in any weather. View of the entire complex from the southeast. A hint of the 'breezeway' design is seen from this distance, with the picnic pavilion rising beyond. The hustle and bustle of a busy golf club. Check-in area enjoys the windows to the left... balcony of the picnic pavilion and the cart storage area underneath, are seen to the right. 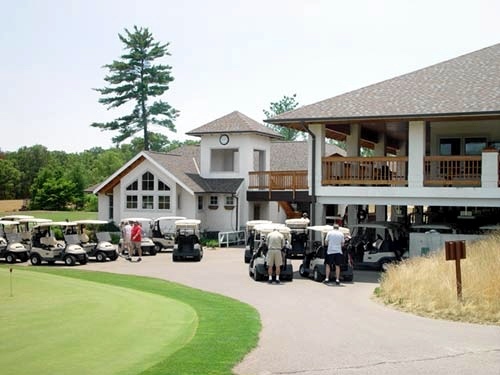 The stair tower connects to a bridge linking the pavilion with the clubhouse. The visitors' main entrance. 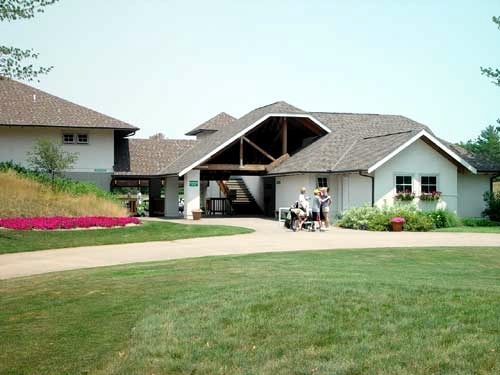 Golfers enter the complex through a large breezeway, which connects all the building elements into a sheltered whole. The picnic pavilion is on the left, bathroom/shower wing is on the right. Open web heavy timber trusses add a barn like character to the breezeway space. The East Elevation, drawn with CAD software, seen from the practice tee area. South Elevation, again drawn with CAD software, depicts the bridged breezeway with the lower clubhouse and the upper pavilion. From the landing at the top of the stair tower, most of the dramatic 'canyon holes' can be seen to the south and east. The North Elevation, showing the entrance to the facility, and the pavilion on the hill above. Simple, old-world materials, such as true stucco walls, were used to give the club a timeless, european feel. The West Elevation, drawn with CAD software, showing the stair tower to the left, and a cut through the breezeway on the right. The opening in the center looks out on the driving range to the southeast. 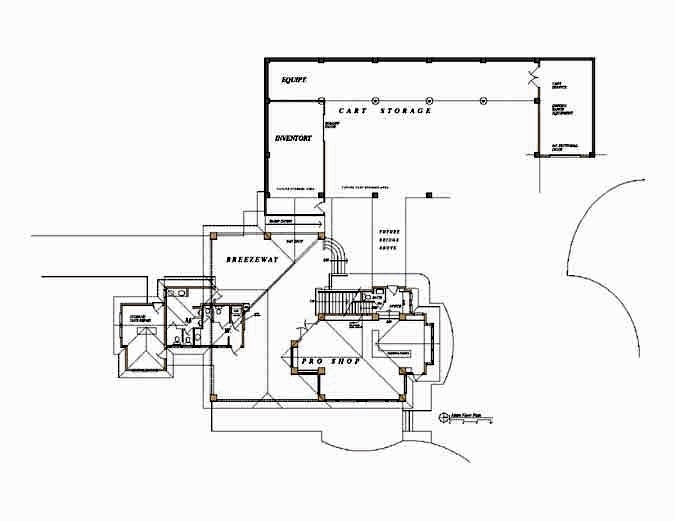 The Clubhouse Floor Plan, showing the 'pods' of use/activity that are covered by the continuous roofline. The underground cart storage area is seen under the pavilion. A modest retail area accompanies the check-in desk in the clubhouse pod. 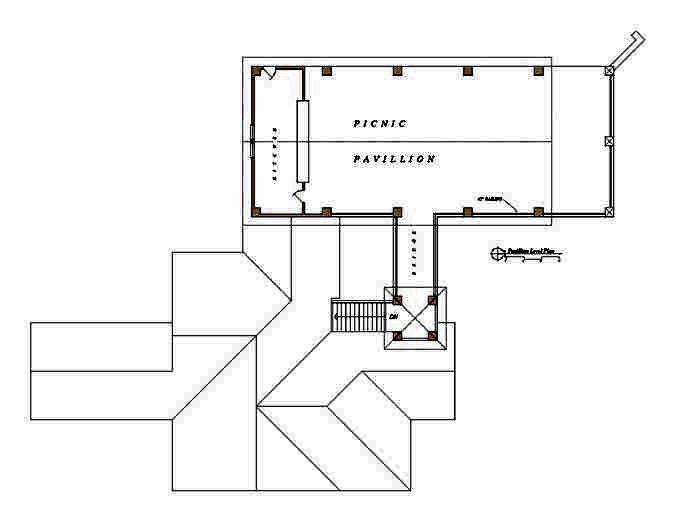 The Pavilion Floor Plan, showing the snack bar, eating/outing area, and the bridge to the stair tower and down to the clubhouse below. Designed to be open, airy, but screened for summer comfort.